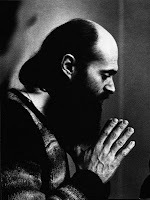 I received a Arvo Pärt playlist from Yan in France, but some albums are only available to Spotify's French users, so I modified and expanded his playlist a little bit. The works are arranged chronologically as Yan did. Thank you Yan, it's really fascinating to go through Pärt's oeuvre of the past 50 years that way. The elevation from his early, severe neo-classical style into a much more mature holy minimalism must be one of the most interesting musical development in history.